case they are directly accessible from outside the class) or as private (in which case they are visible only to other code within the class), just as in Visual Basic, C++, and Java. C# also has variants on this theme, such as protected (which indicates a member is visible only to the class in question and to any derived classes). Data members are those members that contain the data for the class – fields, constants, and events. Data members can be either static (associated with the class as a whole) or instance (each instance of the class has its own copy of the data). As usual for object-oriented languages, a class member is always an instance member unless it is explicitly declared as static. Constants can be associated with classes in the same way as variables. You declare a constant using the constant keyword. Once again, if it is declared as public, it will be accessible from outside the class. Events are class members that allow an object to notify a caller whenever something noteworthy happens, such as a field or property of the class changing, or some form of user interaction occurring. The-client can have code, known as an event handler, that reacts to the event. Function members’ are those members that provide some functionality for manipulating the data in the class. They include methods, properties, constructors, finalizers, operators, and indexers. Methods are functions that-are associated with a particular class. They can be either instance methods, which work on a particular instance of a class, or static methods, which provide more generic functionality that doesn’t require you to instantiate a class (like the Console. WriteLine () method). Methods are discussed in the next section. Properties are sets of functions that can be accessed from the client in a similar way to the public fields of . the class: C# provides a specific syntax for implementing read and write properties on your classes, so you don’t have to jury-rig methods whose names have the words Get or Set embedded in them. Because there’s a dedicated syntax for properties that is distinct from that for normal functions, the illusion of objects as actual things is strengthened for client code. Constructors are special functions that are called automatically when an object is instantiated. They must have the same name as the class to which they belong and cannot have a return type. Constructors are useful for initializing the values of fields. Finalizers are similar to constructors but are called when the CLR detects that an object is no longer needed. They have the same name as the class, preceded by-a tilde (-). C++ programmers should note that finalizers are used much less frequently in C# than their nearest C++ equivalent, destructors , because the CLR handles garbage collection automatically. Also, it is impossible to predict precisely when a finalizer will be called. Operators, at their simplest, are actions like + or -. When you add two integers, you are, strictly speaking, using the + operator for integers. However, C# also allows you to specify how existing operators will work with your own classes (operator overloading). Indexers allow your objects to be indexed in the same way as an array or collection. In Visual Basic,C, and C++, you could define global functions that were not associated with a particular class. This is not the case in C#. As noted earlier, in.C# every function must be associated with a class or struct. The syntax for defining a method in C# is just what you’d expect from a C-style language and is virtually identical to the syntax in C++ and Java. main s tactical difference from C++ is that, in C#, each method is se paratel declared as public or private~ 1s not possible i e. blacks to group several method definitions. 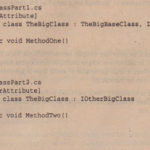 Also, all C# methods are declared an defined in the class definition. There is no facility- to separate the method implementation as there is in C++. The following example, MathTest, illustrates the syntax for definition and instantiation of classes, and definition and invocation of methods. Besides the class that contains the Main () method, it defines a class named MathTest, which contains a couple of methods and a field. As you can see from the code, the MathTest class contains a field that contains a number, as well as a method to find the square of this number. It also contains two static methods, one to return the value of pi and one to find the square of the number passed in as a parameter. Some features of this class are not really good examples of C# program design. For example, Getpi ( ) would usually be implemented as a const field, but following good design here would mean using some concepts that we have not yet introduced. Most of the syntax in the preceding example should be familiar to C++ and Java develpors. If your background is in Visual Basic, just think of the MathTest class as being like a Visual Basic class module that implements fields and methods. There are a couple of points to watch out for though, whatever your language. Notice how the value of f remains unchanged, but the-value changed in Int s is also changed in the original array. The behavior of strings is different again: This is because strings are immutable (if you alter a string’s value, you create an entirely new string), so strings don’t display the typical reference-type behavior. Any changes made to a string within a method call won’t affect the original string. Adding the ref keyword in C# serves the same purpose assuming the & syntax in C++ to specify passing by reference. However, C# makes the behavior more explicit (thus hopefully preventing bugs) by requiring the use of the ref keyword when invoking the method. Finally, it is also important to understand that C# continues to apply initialization requirements to parameters passed to methods. Any variable must be initialized before it is passed into a method, whether it is passed in by value or by reference. that have been passed to the method by reference. Often, the starting values of the variables that are passed by reference are unimportant. Those values will be overwritten by the function, which may never even look at any previous value. It would be convenient if you could use the same convention in C#. However, C# requires that variables be initialized with a starting value before they are referenced. Although you could initialize your input variables with meaningless values before passing them into a function that will fill them with real, meaningful ones, this practice seems at best needless and at worst confusing. However, there is a way to short-circuit the C# compiler’s insistence on initial values for input arguments. The out keyword is an example of something new in C# that has no analogy in either Visual Basic or C++ and that has been introduced to make C# more secure against bugs. If an out parameter isn’t assigned a value within the body of the function, the method won’t compile. C# supports method overloading – several versions of the method that have different signahires is, the same name, but a differentnumber of parameters and or different parameter data types). It is not sufficient for two methods to differ only in their return type,. It is not sufficient for two methods to differ only by virtue of a parameter having been declared as ref or out . To define a property in C#, you use the following syntax:. Note the naming convention used here. You take advantage of C#’s case sensitivity by using the same name, Pascal-cased for the public property, and camel-eased for the equivalent private field if there is one. Some developers prefer to use field names that are prefixed by an underscore: _foreName; this provides an extremely convenient way of identifying fields V”JSual Basic 6 programmers should remember that C# does not distinguish between VIsual Basic6 Set and Visual Basic6 Let: In C#, the write accessor is always identified with the keyword set. It is similarly possible to create a write-only property by omitting the get accessor. However, this is regarded as poor programming practice because it could be confusing to authors of client code. In general, it is recommended that if you are tempted to do this, you should use a method instead. C# does allow the set and get accessors to have differing access modifiers. nus would allow a property to have a public get and a private or protected set. This can help control how or when a property can be set. In the following code example, notice that the set has a private access modifier and the get does not have any. In this case, the get takes on the access level of the property. One of the accessors must follow the access level of the property. A compile error will be generated if the get accessor has the protected access level associated with it because that would accessors a different access level from the property. The decIaration private string foreName; is not needed. The compiler will create this automatically. As in C++ and Java, it’s not necessary to provide a constructor for your class. We haven’t supplied one for any of the examples so far in this book. In general, if you don’t supply any constructor, the compiler will just make up a default one for you behind the scenes. It will be a very basic constructor that just initializes all the member fields by zeroing them out (null reference for reference types, zero for numeric data types, and false for boo Is). Often, that will be adequate; if not, you’ll need to write your own constructor. 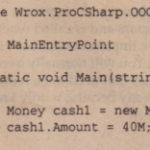 For C++ programmers: Because primitive fields in 0# are by default initialiZed by being zeroed out. whereas primitive fields in C++ are by default uninitialized, you may find that you don’t need to write constructors in C, as often as you would in C++. If your class serves only as a container for some static members or properties and therefore should never be instantiated. One novel feature of C# is that it is also possible to write a static no-parameter constructor for a class. Such a constructor will be executed only once, as opposed to the constructors written so far, which are instance constructors that are executed whenever an object of that class is created, There is no equivalent to the static constructor in C++ or Visual Basic 6. One reason for writing a static constructor is if your class has some static fields or properties that need to be initialized from an external source before the class is first used. The .NET runtime makes no guarantees about when a static constructor will be executed, so you should’ not place any code in it that relies on it being executed at a particular time (for example, when an assembly is loaded). Nor is it possible to predict in what order static constructors of different classes will execute .’However, what is guaranteed is that the static constructor will run at most once, and that it will be invoked before your code makes any reference to the class. In C#, the static constructor usually seems to be executed immediately before the first call to any member of the class. Notice that the static constructor does not have any access modifiers. It’s never called by any other C# code, but always by the .NET runtime when the class is loaded, so any access modifier like public or private would be meaningless. For this same reason, the static constructor can never take any parameters, and there can be only one static constructor for a class. It should also be obvious that a static constructor can access only static members, not instance members, of the class. Note that it is possible to have a static constructor and a zero-parameter instance constructor defined in the same class. Although the parameter lists are identical, there is no conflict. That’s because the static constructor is executed when the class is loaded, but the instance constructor is executed whenever an instance is created – so there won’t be any confusion about which constructor gets executed when. Note that if you have more than one class that has a static constructor, the static constructor that will be executed first is undefined. This means that you should not put any code in a static constructor that depends on other static constructors having been or not having been executed. However, if any static fields have been given default values, these will be allocated before the static constructor is called. The next example illustrates the use of a static constructor and is based on the idea of a program that has user preferences (which are presumably stored in some configuration file). To keep things simple, we’ll assume just one user preference – a quantity called BackColor, which might represent the background color to be used in an application. And because we don’t want to get into the details of writing code to read data from an external source here, we’ll make the assumption that the preference is to have a background color of red on weekdays and green on weekends. All the program will do is display the preference in a console window – but this is enough to see a static constructor at work. Of course ifthe code isexecuted during the weekend, your color preference would be Green. In this example, the two-parameter constructor executes before any code in the body of the one parameter constructor (though in this particular case, because there is no code in the body of the one-parameter constructor, it makes no difference). A C# constructor initializer may contain either one call to another constructor in the same class (using the syntax just presented) or one call to a constructor in the immediate base class (using the same syntax, but using the keyword base instead of this). It is not possible to put more than one call in the initializer. The syntax for constructor,initializers in C# is similar to that for constructor initialization lists in C++, but C++ developers should beware: Behind the similarity in syntax, C# initializers follow very different rules for what can be placed in them. Whereas you can use a C++ initialization list to indicate initial! values of any member variables or to call a base constructor, the only thing you can put in a C# initializer is one call to one other constructor. This forces C# classes to follow a strict sequence for how they get constructed, whereas C++ allows some leniency. The concept of a constant as a variable that contains a value that cannot be changed is something that C# shares with most programming languages. However, constants don’t necessarily meet all requirements. On occasion, you may have some variable whose value shouldn’t be changed, but where the value is not known until runtime. C# provides another type of variable that is useful in this scenario: the readonly field. The readonly keyword gives a bit more flexibility than const, allowing for situations in which you might want a fielcMt>be constant but also need to carry out some calculations to determine its initial value. The rule is that you can assign values to a readonly field insidea constructor, but not anywhere . else. It’s also possible for a readonly field to be an instance rather than a static field, having a different value for each instance of a class. This means that, unlike a const field, if you want a readonly field to be static, you have to declare it as such. In this case, the field is static, because the maximum number of documents needs to be stored only once per running instance of the program. This is why it is initialized in the static constructor. If you had an instance readonly field, you would initialize it in the instance constructor(s). For example, presumably each document you edit has a creation date, which you wouldn’t want to allow the user to change (because that would be rewriting the past!). Note that the field is also public – you don’t normally need to m1.ke readonly fields private, because by definition they cannot be modified externally (the same principle also applies to constants). It’s also worth noting that you don’t have to assign a value to a readonly field in a constructor. If you don’t do so, it will be left with the default value for its particular data type or whatever value you initialized it to at its declaration. That applies to both static and instance readonly fields.